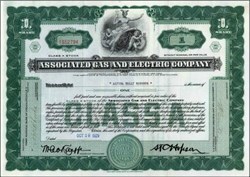 Beautifully engraved certificate from the Associated Gas and Electric Company issued in 1930. 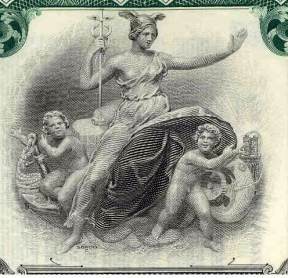 This historic document was printed by the Security Banknote Company and has an ornate border around it with a vignette of an allegorical woman and cherubs. This item has the printed signature of the company's Vice President and Assistant Treasurer and is over 72 years old. The company was incorporated in New York in 1906 to acquire and hold securities of companies operating or controlling public utilities and affiliated enterprises. The managed property or had ownership in New York, Kentucky, Tennessee and Massachusettes. The affiliated company's included the New York State Gas and Electric, Southern New York Power, Murray Electric Light & Power, Liberty Light & Power, Southern New York Power and Railway, Spring Brook Water Company, Kentucky Public Service Company, Kentucky-Tennessee Light & Power, Greenville Gas Light Company, Van Wert Gas Light Company, and Cape & Vineyard Electric Company at Cape Cod and Marthas Vineyard. The company was reorganized a General Public Utilities Corporation in 1946. General Public Utilities Corporation name was changed to GPU, Inc in 1996. Today, GPU Inc. is an international provider of energy-related infrastructure and services. Domestically, its three electric utility subsidiaries - doing business as GPU Energy - serve two million customers in Pennsylvania and New Jersey. Through the GPU International Group, GPU develops, owns and operates transmission and distribution facilities overseas. Altogether, GPU serves more than 4.5 million customers around the world. GPU Advanced Resources, Inc. sells competitive retail energy and services in the Mid-Atlantic region. The company distributes electricity to more than 2 million customers in New Jersey and Pennsylvania through its GPU Energy units. In response to deregulation, GPU has sold off most of its domestic generation facilities, including independent power projects outside its distribution territory. The firm also has electricity distribution (more than 2.5 million customers) and gas transmission holdings in the UK, Argentina, and Australia. GPU is pursuing other nonregulated activities, including power marketing, foreign independent power projects (1,500 MW), telecommunications, and electrical and mechanical contracting. Ohio-based FirstEnergy has agreed to buy GPU.